During our stay in the US this summer, I spent a lot of time hanging around Bikram Yoga New Haven, on Elm Street. I must have passed this Perkins Rubber Stamp Company sign at least 20 times. The business is still listed at 43 Elm Street and you can still buy rubber stamps from them. I’m not the only one who loves this sign. Here are a couple of photos of it on flickr. But as far as I know, this is the only painting of it. I began this picture before we left Paris in July, was able to take more notes during the summer, and just finished it last week. What I love about this sign is its attempt at permanance. It’s a massive metal and glass structure, fastened to the stone building with steel chains. (The stone facade, in this morning light, reminds me of the yellow ochre color of Parisian buildings.) Yet the paint on the sign is peeling, and the neon lights (I think) no longer work. 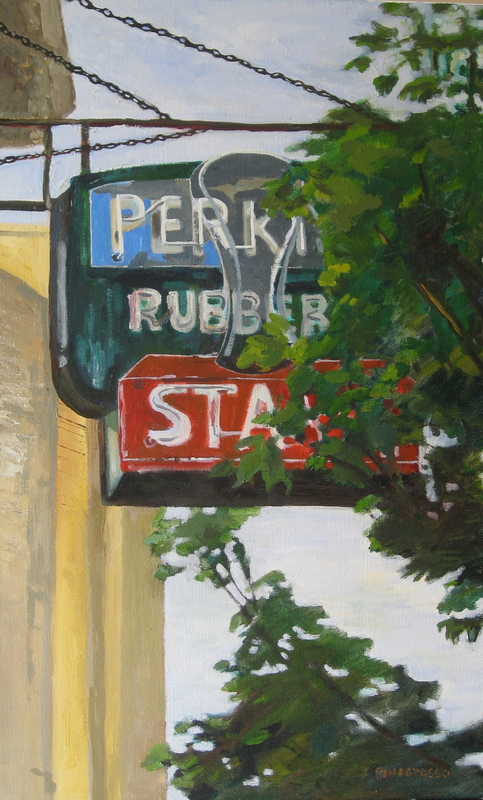 This is the fifth painting in the series Sign Paintings. Here are more from a previous post. I love seeing your paintings. It must be so satisfying to paint them and then have this immediate venue to share them. Loved the color in the Japanese Maple. Thanks for posting. oops. I meant to post this on the Three Oil Sketches post! Aimee, Thank you so much for your email, and for enjoying my paintings. Yes, it has been very satisfying to paint these. (I realize you were looking at the Japanese Maple when you wrote this comment).